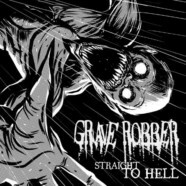 Grave Robber, classified as Christian horror punk, has been terrorizing the Midwest area since 2005. Hailing from Fort Wayne, Indiana, the band aims to terrify by holding nothing back both when recording and performing. Their vicious energy and raw intent to destroy serve as the framework for their newest EP, Straight to Hell. Irresistibly catchy beats serve as backbones for each of the tracks, setting it apart from some traditional punk albums in terms of its appeal to audiences outside of the scene. This does not mean, however, that Straight to Hell lacks anything in brutality. The tracks are endlessly aggressive, yet artfully so. The experience of the group becomes clear- the energy is calculated to kill, controlled but by no means subdued. The group successfully merges ferocity and artistry. Straight to Hell gives off a sense of theatricality, which is reinforced with its lyrics. Labeling the album as “Halloweenish” may come across as offensive (can you really name a song “Mummator” without putting out that kind of vibe? ), but we aren’t talking about trick-or-treating here. The R-rated side of October 31 is the thoroughly represented- zombies aren’t dancing but rather hunting out flesh, werewolves are slaughter-machines, and vampires sure as hell aren’t sparkling. The lyrics, although dark, are not deep. They contain neither description nor whining about personal relationships or past abuses, instead tapping into the fears hidden within our minds. Adding to the eerie mood, “WRETCHED”’s vocals are alarmingly calm for the hardness of the instrumentals. Within the punk genre, voices tend to be intense, passionate, and emotional. His vocals, however, is commanding and unwavering. He doesn’t really care what happens to you, his audience, during the chaos and horror he describes so matter-of-factly. If the band was going for supernatural ferocity, they hit the nail on the head. I highly recommend you take an opportunity to see these guys live- judging by the photos on social media, they would put on one hell of a show.